Flavas24/7 is a 24-hour medical marijuana delivery service that offers the high-quality organic strains of mmj. The product selection here includes: Sativa Indica Hybrid various extracts superglues rerolls syrups brownies other edibles Flavas24/7 is constantly expanding its stock selection based on customer preferences. Moreover, Flavas24/7 is committed to providing best possible services and special deals to its clients. First-time patients are treated with free gifts. Flavas24/7 does its best to maintain the reputation of a company providing quality and discrete services. There's a common preconception about marijuana's negative effects on human body. Flavas24/7 aims at dispelling this myth and proving that cannabinoids can be used to help improve people's health. 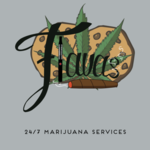 Here at Flavas24/7, you will find a group of proud and dedicated experts who can provide customers with an extensive consultation on the matter of choosing the proper type of medical marijuana.